Meets on the 2nd Thursday of each month from 7-8:30 pm in the Community Room. The first session will be September 14th. 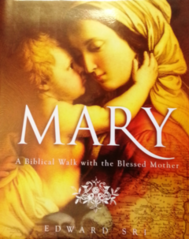 Watch and discuss "Mary: A Biblical Walk with the Blessed Mother" by Edward Sri. Women of all ages are invited to join us. There is no cost for this group and no need to register. Join us as you can. For questions contact Cindy Anderst in the parish office at 255-4600.